Okay, I have eight days until runDisney’s Star Wars Dark Side Half Marathon Weekend. Only EIGHT DAYS and I have quite the hefty to-do list going on, which includes getting all of my 2018 Princess Half Marathon content finished! Yikes! The reasons for my delay are: I spent a lot of my non-work hours in March and early April finishing the first draft of a mid-grade novel now that I’m on a major quest to resurrect my saggy writing career. (You can read more about my writer life here!) And second, I must admit to being seriously burned out after completing all our Dopey Challenge content. And third, I’ve been giving my whole life a major makeover which includes taking on Beachbody’s 80 Day Obsession program, which I’ll blog more about soon. But nope, no more delaying, time to roll my sleeves up and attack PHM content, starting with this post about my arrival day on Wednesday, February 21st! I have my timer set for 45 minutes, which means I have to write fast and can’t obsess about perfection. So here goes! Now, it’s become a tradition for Sara and me to arrive a day early and leave a day later. I love having the extra time to settle in and fully enjoy the parks after the challenge. This is why I love being self-employed … it comes with the blessing of rearranging your schedule to accommodate this! There are drawbacks, trust me. But not when it comes to Disney trips! Don’t be completely fooled by the blissful look on my face, though. I wasn’t feeling very good about myself that day. 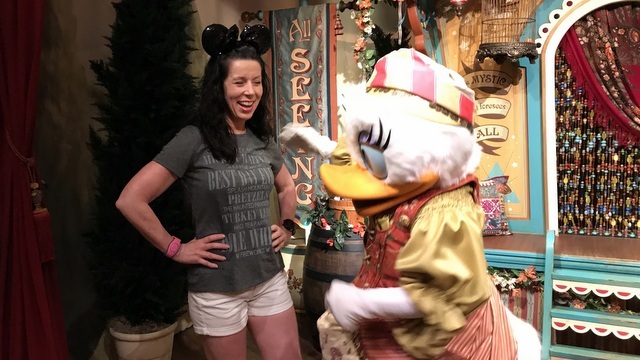 I had gained weight and let my conditioning seriously drop after January’s WDW Marathon Weekend plus I was exhausted from last-minute work, packing, and costume prep. I also didn’t accomplish my goal of finishing Heroes, Wishes, and Trailer Park Hitches, my midgrade novel, so yeah. I was feeling pretty crappy and discouraged with myself. So were my roommates who joined me later that day. More on that in my next post, though. 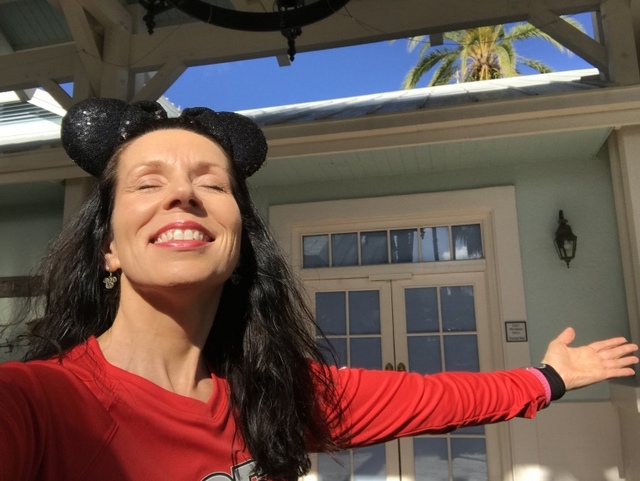 For now, I was in sunny Florida wearing shorts, (and tons of sunblock on my lily-white skin,) so it was time to hit the parks before my friends arrived! (Oh, how I love early flights!) I’m always unsure which park to go to, first, though. Call it the whole kid-in-the-candy-shop feeling. So I let fate decide by taking the next bus that arrived. That was actually fantastic, seeing as how it’s been years since I’ve been there, back when it was called Downtown Disney. 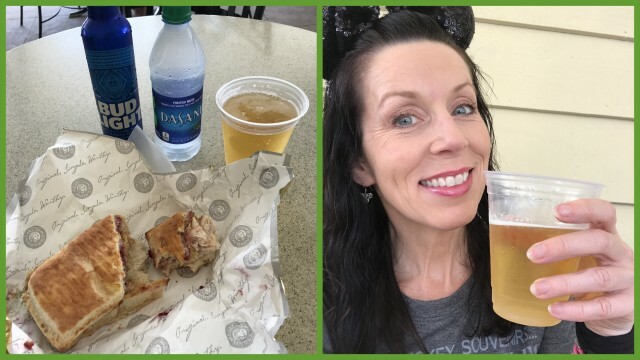 So much had changed plus I was craving one of my favorite meals: Earl of Sandwiches’ Holiday Sub, yum! I was the lone rider on the bus, so I had a nice chat with the driver about Disney Springs and the many changes. 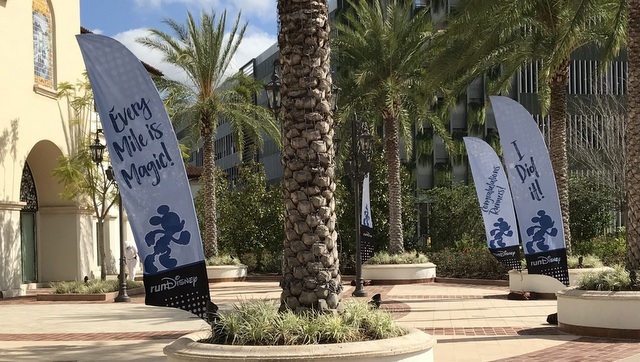 After arriving, it was really awesome seeing the many runDisney banners! It added such a festive touch and wow, Disney Springs is looking seriously gorgeous! I didn’t plan on buying anything although there was some serious temptation going on in Vera Bradley and the Marketplace after one of the Dooney & Bourke bags made me gasp. And of course, I always want everything in Trend-D. I really wanted to watch my pennies during this trip. 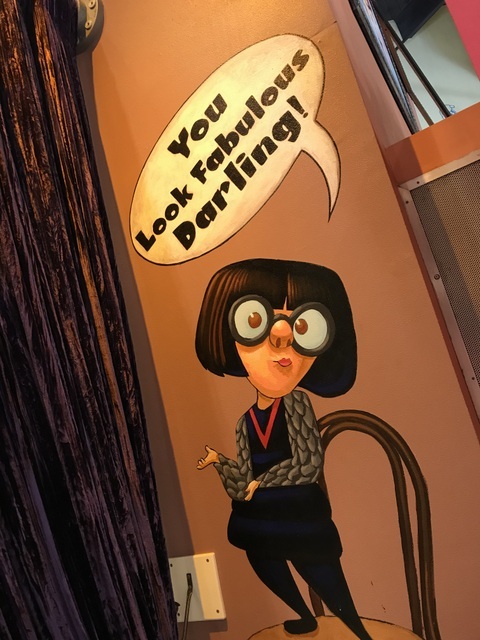 While wandering through World of Disney, however, some cute tee-shirts caught my eye. Hmm. My long-sleeve shirt was feeling rather hot. And those tees were rather awesome. How could I not buy one! 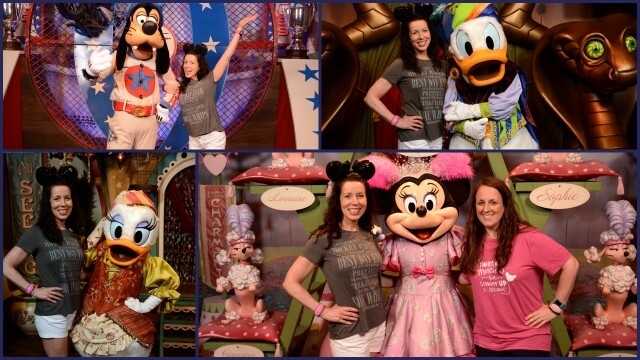 Plus there’s something about wearing a Disney shirt and Disney ears while you’re in Disney, right? Afterward, I made the traditional loop into Ghirardelli’s for a free sample of chocolate, which probably annoys the employees there to no end. Then one of my favorite places to eat at Disney came in sight: Earl of Sandwich! There were more paths I wanted to take and stores I wanted to check out, like the beard shop for my eldest son and Under Armour since I’m a Baltimore gal who loves that brand. But Sara’s plane had arrived … woo-HOO! So I headed back to Old Key West, dropped off my bag, and headed to Magic Kingdom where we planned to meet. With much time to kill … and me surprisingly hungry again, I had my traditional salmon meal at Columbia Harbor House, since I always like to have a few healthy meals at the beginning of a trip. Afterward, I hit up a couple rides and got some character photos. Lines were long, but that was okay. I had a great book to read on my phone’s Kindle app while waiting and the weather felt amazing. Now about poor Pooh. 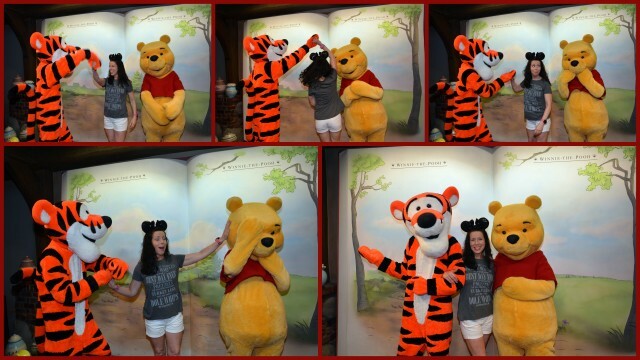 I might have accidentaly bopped him in the head while being twirled by Tigger. Oops! He was rather upset, but we hugged and made up. 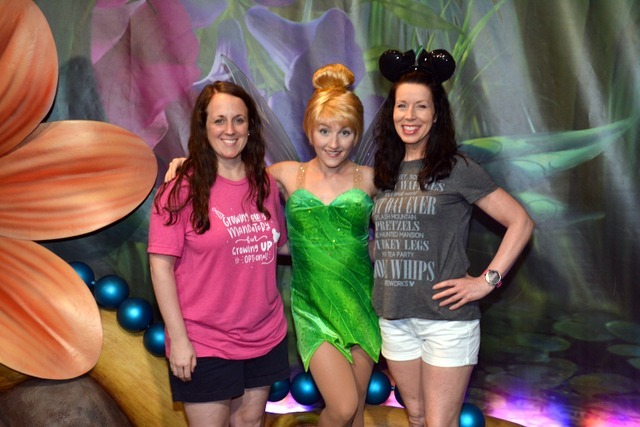 Sara was soon to arrive so I headed to Main Street to give her a big hug and since she’s a fellow character photo addict, we popped in to say hello to Tink! Next up, Pete’s Silly Sideshow to say hello to Donald, Goofy, Daisy and Minnie! I’m happy to report that no characters were bopped in the head this time. Daisy rather liked my shirt, too. It was blazing hot, but we decided to watch the parade. In the sun. Honestly, it was hardly the smartest choice but we toughed it out since … I don’t know, the sun just felt amazing after freezing my bum off at home! Plus we had a good viewing spot and didn’t feel like moving. Sigh. Seeing the Grand Marshals reminded us of our amazing experience being parade marshals! 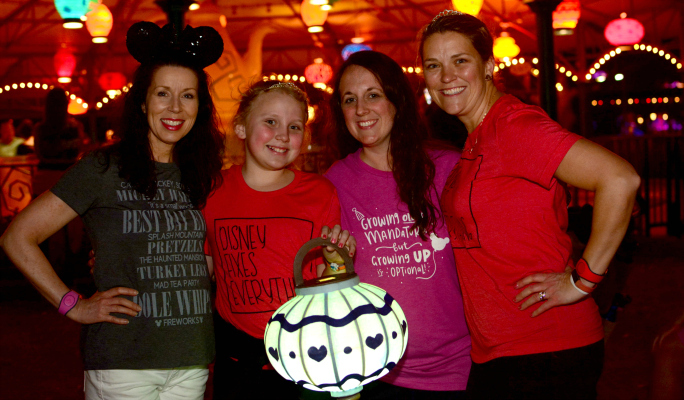 After the parade, we wandered and rode a few rides until Stephanie and her adorable daughter, Maggie arrived. Maggie was SO EXCITED that she gave us the biggest hugs every! She was going to the run the 5k with Stephanie and bursting with happiness. This always brings tears to my eyes! 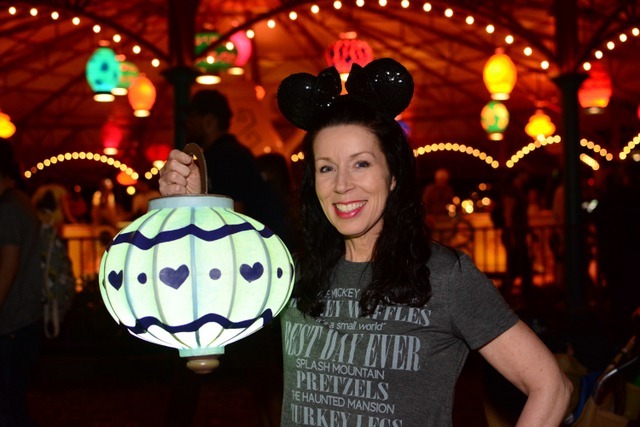 We rode the Seven Drarfs Mine Train and then headed to the teacups to get one thing from my Disney bucket list: A picture with the lantern! We didn’t make it over to Rapunzel’s tower to get one there, so that’s on my Star Wars bucket list for sure! We hit up some more rides after that … Space Mountain for sure, my memory is getting kind of foggy, until it was time for dinner. Oh my gosh, y’all. The counter service order option on My Disney Experience’s app is AMAZING!!!! Lines were long at Cosmic Ray’s, but we went right to the pick up area and had a minimal wait. My fries were also amazing … so much for eating healthy! Since we had many long days ahead of us, we headed back to the resort after the fireworks. Shannon was supposed to arrive but her flights kept being moved back due to wintery storms! There was some serious prayers going on that she’d be able to fly out. It was very late when she got to Old Key West … like 1:00am, I think, but thank goodness she made it! I’ll pick up on the rest in my next post about the expo. For now, my timer is done, so I’m going to give this a very quick read and hit that schedule button! Until then, how about you? 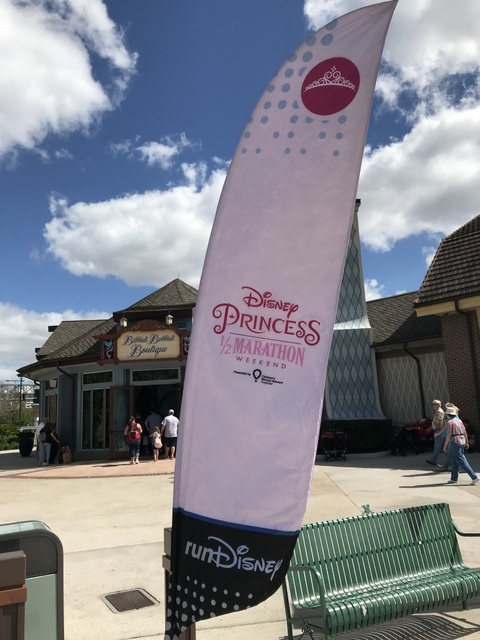 QOTD: Were you at the Princess Half Marathon weekend? If so, what day did you arrive and which park must you always see first? Take care, thanks for reading, and have a joyful day! When my parents had their time share at the Boardwalk, we’d always hit up EPCOT first because we could walk over. It always felt good to be in the warm sunshine, walking around after traveling. 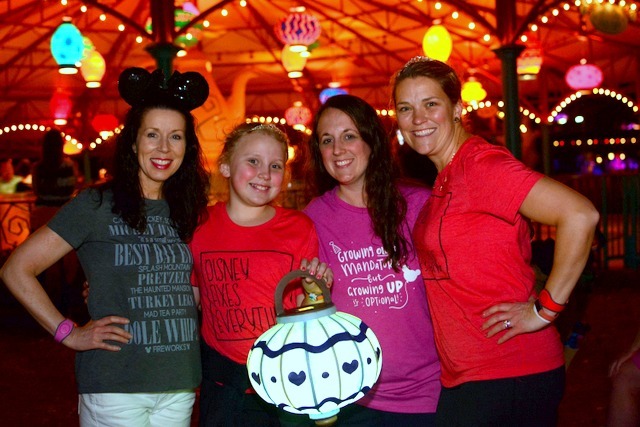 Next post: Podcast Episode 39: Ladies Night – Star Wars Half Preview with a Surprise Streak! Previous post: Accountability Quest: My 2018 Second Quarter Goals!